Soft and warm: Merino wool, refined with cashmere. A rare original: Irish cable-knit accessories that actually come from Ireland. Made on hand-knitting machines since time immemorial. By Fisherman out of Ireland. For decades, the experienced knitters at the traditional Fisherman out of Ireland knitwear workshop in Kilcar/County Donegal have created these exquisite accessories on trusty hand-knitting machines. Carefully handmade in a time-consuming process which requires a lot of skill, the accessories will almost last a lifetime. A world apart from short-lived mass-produced products from the Far East. And despite the exquisite quality, they are still pleasantly affordable. The 3D cable pattern is typical of the region and has symbolised the ropes of the Irish fishing boats for generations. The hat perfectly moulds to the shape of your head. 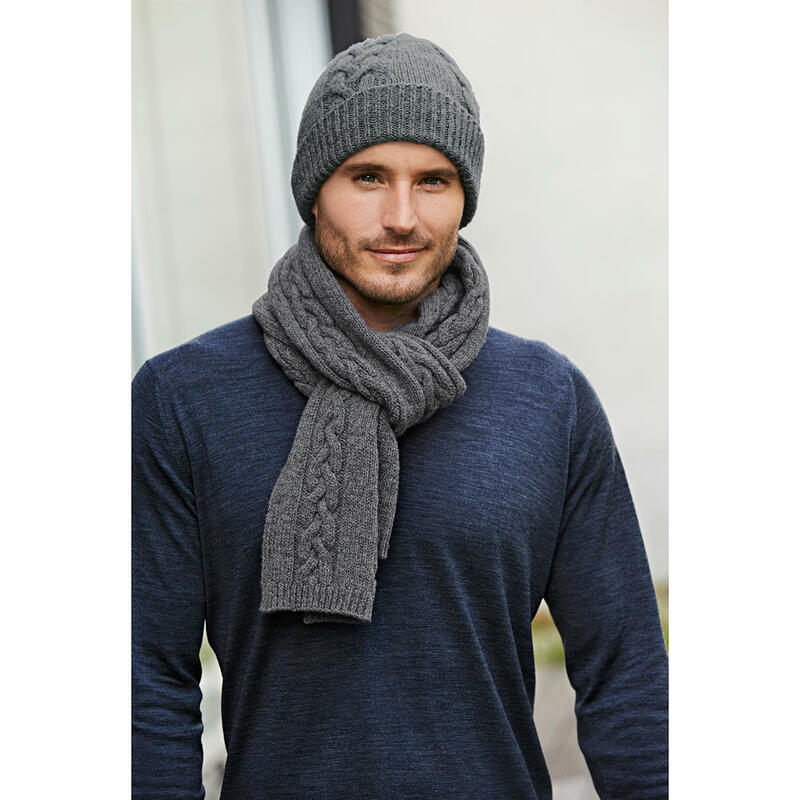 The wide ribbing guarantees a perfect fit, keeping your ears warm as needed. The scarf measures a generous 21 x 180cm (8.3” x 5ft9”). Colour: Grey. 95% wool, 5% cashmere. Hand wash. Made in Ireland.